Ample parking located in the lot in front of the restaurant. Full service catering is available, please contact us for more information. We offer banquet facilities for weddings, anniversary parties, birthday, wedding receptions, graduation parties and corporate events. Oldest existing restaurant in Chesterfield. Serving the St. Louis area for over 50 years. 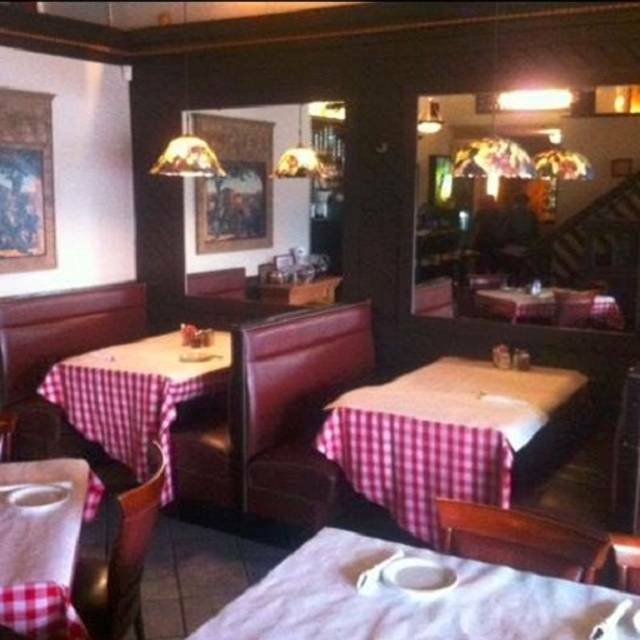 Specializing in Italian Cuisine with the largest variety of pizza selection in the area. Overall, it was nice. Some of the food wasn't as good as expected - e.g. shrimp scampi and chicken parm. Other entrees, pizza, burger, etc. were excellent. I was surprised when we arrived and they did not have our reservation. They said the Open Table reservations do not come through to the restaurant. I wasn't sure what that meant - but was pleased they could accommodate our party of 10. Always a pleasure to dine at Talayna’s ! We were seated promptly. Our waiter was very courteous. The food was very good. I would recommend to family and friends. Went here because I used to go to the original location near Washington U. Not as good as I remember but it was a long time ago. Not the best cannelloni, just OK. Ashed for the salmon to not be overcooked and it came mostly raw. Nice service though. Should have tried the pizza I guess. A simple date night involving some good wine, a chicken piccata dinner and a kabob dinner. Nice house salads and side dishes too. Sitting in the lower level is fine, but not in the corner booth under the stairway. The footsteps make this very noisy. Smelled delicious when we stepped inside, but overall diappointed. Garlic cheese bread was a hoagie roll w/ cheese. Chick alfredo was too thick, not creamy. Salad was ok. Maybe should have ordered the pizza. The food was delicious. We had a group of 10 people, and everyone enjoyed their meals. We made reservations on Open Table, but when we arrived, the table was not ready. Our server suggested that sometimes Open Table does not work, despite receiving a confirmation. So I suggest if you make a reservation through Open Table, to call the restaurant directly anyhow and confirm. Although this kind of defeats the purpose of reserving on Open Table, a simple call can possibly help avoid delays or not having a table at all. We ate dinner here on New Year's Eve and everyone enjoyed it. Our group of 4 consisted of two adults and two teenagers (boy and girl) and we all enjoyed the Chicago style pizza. The service was great and we didn't have to wait past our reservation time. Well recommended! Food is consistent on the numerous trips we have been there. The pizza is one of the best that we have found in St.Louis. From NY, Chicago style to St. Louis style they have it all. No frills, but good food at a reasonable price. The owner personally called to tell me he submitted our credit for dining. Very impressed. Our server must have been high on life or something as she tried to take our order from the podium before handing us menus and getting us to a table. One of the attractions of the restaurant was a Mediterranean menu which was not included on the menu. The food was just OK and my wife, who eats gluten free was particularly disappointed with the narrow choices compared to the menu posted on the website. The restaurant was packed on Friday evening. Usually when I am there it is a very small crowd. It took us 15 minutes to get water. They brought our entree before our bread and salad. I sent it back so i could enjoy the salad first. The manager/owners didn't seem to be helping the staff. Just standing behind the bar. Most of the wait staff have been waiting tables a long time. Our server that night, not the case. Their pizza is spectacular as well as their chicken piccata. Others in my party ordered spiedini and found it different than they were expecting traditional spiedini to taste like. It was good but a little disappointing to the foodies in my group. Thank you for accommodating our large party. The food was very good! I received a coupon telling me to come out to celebrate Mother’s Day. So we did, and we brought the coupon. I was never told of any Mother Day specials. At the end of the meal, I presented my coupon, but I was told that coupons aren’t accepted on holidays. Even though it didn’t say that anywhere on the coupon, but the coupon did say to come in on Mother’s Day. It was disappointing. The penne con broccoli wasn’t very good either and everything was drenched in parsley. It wasn’t s garnish of parsley, my whole plate was covered. I did not get to go as I ended up in the hospital but everyone was very pleased with it. They said the food was great and reasonable and look forward to returning. We were a party of ten, 8 adults and 2 children. We were under a time constraint, and our server did a great job of bringing our salads, and bread, followed by our entrees. The children had pizza, as did one of the adults. Their plates were cleaned. A clear indication the pizza was good. The rest of us had various pastas, and an Eggplant Parmesan. The pastas were all served hot, and very tasty. We have been to Talayna’s on several occasions and have never been disappointed. The service Is consistently good and the food is excellent. It’s casual dining at its best! Talayna’s has the best Caesar Salad, wings and Old World Pizza in the world! I’ve enjoyed dining with them over 35 years! Yummy bread with herb seasoned olive oil! Great house salad with provel cheese. A great way to start your meal. The cheese garlic bread is not the same😞 it eas where we had our first date, down on skinker ave.our 42nd anniversary wasn't so special. The atmosphere was very pretty. I feel like it could have been more options for the occasion but it was nice. Food was very tasty. Food was outstanding. They had 2 waitress that called in sick that day and were very short handed. The mgmt. and others did all that they could to keep up with the demand. Certainly enjoyed our dining experience. Great home made tasty entrees. We had not been to this restaurant before. We had been to the other Talayna's locations in the past and always enjoyed them. I'm glad we came here. Pizza was great and the toasted ravioli was excellent. Nice place for a casual, quiet meal. They did not have record of my reservation. Fortunately it was early enough and they could set up a table for 12. Server seemed disinterested She took our order and our food came out quickly. But she just didn’t seem to want to have our table. Pizza. Pasta. And salads all very good. We had another great Italian meal here. We love the live music on Saturday nights. Their pizza is delicious! Their staff is so friendly. It’s a fun, family-friendly place! We had another great meal at Talanya’s. The food was delicious . We had the ravioli and the Kids pasta with a meatball which was reasonably priced and delicious. We were able to watch a little sports in the big screen too. We always enjoy the paper in the tables so the kids can color. The staff is always so friendly and eager to please. This is such a fun family friendly restaurant. Another fun weekend with good food at this neighborhood restaurant. We always enjoy the food and friendly staff.! It’s a neighborhood gem. It’s always lively and live music on the weekends! This would have been better if we weren't stuck in the lower room with no acoustics and loud kids everywhere. We must have had an off night. We love this pizza! It's Stl style and was great as usual. I had the cannaloni which I will never order again. It's was like manicotti and all you could taste was heavy cheese. That's a good thing if I had ordered nachos or pizza but the dish was over priced , over cooked and just not a good taste. I will stick to the pizza next time. It's a fun place to hang out with friendly wait staff and good sports on the televisions. Amazing food!! Very helpful wait staff. Great food for the price! The waitresses seemed to be overworked. The food is probably good if your a fan of provel cheese, but for those of that are not originally from STL and do not like provel then not so good. I'd specify on the menu that you are St. Louis Italian not true Italian. The Chicken Parmesan wasn't half bad after I scraped the cheese off of it. The personal pizza specifically says mozzarella on the menus, but came out with provel on it also. Very disappointing outing for others day.